now reading: How Does Electrocution Kill You? We're all conscious of the dangers of electricity. We know that 3-volt batteries are safe, but outlets are dangerous enough that they should be covered in order to protect toddlers. We also know not to use a hair dryer in the bathtub. But why? How does electricity actually hurt people? Volts and amperes (amps) are properties used to describe most simple electrical phenomena in the world around us. Amperage (A) is a measure of current flow, i.e., how many electrons flow through something per second. One amp is about 6 million trillion electrons per second. This flow of electrons is what actually causes tissue or nervous system damage. All those electrons passing through a body either heat and burn tissues or interfere with essential electrical signals, such as those that cause the heart to beat. The latter phenomenon is why an electrocution above a certain amperage will cause your muscles to clench and make it impossible for a person to let go of the current source. Being physically unable to let go of a live wire is called tetanic contraction. Voltage (V) is how strong the "urge" is for the current to flow. Voltage is the push on the electrons. A rough analogy is that current is like water molecules, and voltage is like a slope. The steeper the slope, the more the water molecules wants to flow down it. Zero voltage between two points is like a plateau and, hence, there is no current flow. An object's electrical resistance (measured in ohms) limits the amount of current that any voltage can drive through it. The stronger the resistance, the more voltage you need to push the same amount of current. The body's natural resistance is its defense against electricity. Internal tissue has a low resistance compared to the skin. Thus, small shocks are not a problem, but once the skin is breached, the rest of the body is defenseless. That explains why a 3-volt battery is harmless, but Old Sparky was rather deadly. Wet or damaged skin has 100 times less resistance than when dry. Dropping an electrical appliance into the bathtub can be lethal for precisely this reason. 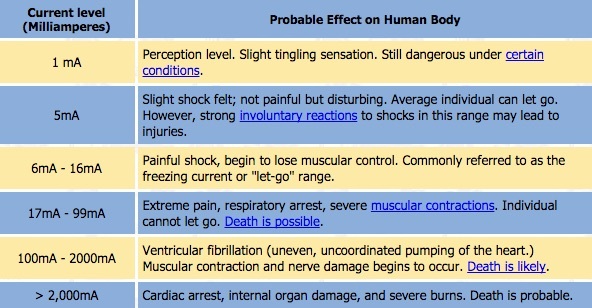 Thus, a 120-volt hair dryer dropped in the bathtub can kill a person but grabbing the terminals of a 12-volt car battery with dry hands produces no meaningful shock. Another factor is the difference between alternating current (AC) and direct current (DC). A constant voltage between two points can drive a current that does not fluctuate (DC). However, a fluctuating voltage drives an alternating current (AC), in which electrons are actually being spit out of an electrical outlet and then sucked back into it roughly 60 times per second. The fluctuation rate of 60 Hz makes these currents particularly suited to screwing up the nerves that regulate heartbeat. This can cause a heart to flutter instead of beating normally, which kills a person quickly. That's why standard AC wall current is especially dangerous to humans. The threat of AC current varies widely by its frequency, whereas DC simply becomes more dangerous as the voltage and current levels increase. These are just general guidelines. In reality, a relatively small current could flow into one hand, directly through the heart, and out the foot to kill a person instantly. On the other hand, an enormous electrical arc from a lightning bolt might hit a person but, instead of traversing the inside of the body, find the easiest path to travel through the skin and result only in burns. In other words, electricity's effect on the body depends on the specific path the current takes through the body and on the individual characteristics of a person's body. A very large amount of current can kill a person simply by cooking the insides. A smaller amount of current can kill a person if it flows directly through the heart or central nervous system. The amount of water and fat insulation in the body factor in here. So kids: Don't drink and drive, don't do drugs, and don't drop hair dryers in the bathtub.